What to do with rejected asylum seekers? As the EU considers tougher rules for returning asylum seekers who had their application rejected, more people might be placed in detention and the possibility of voluntary return could be limited, writes Anna Lundberg. Anna Lundberg is a professor at Linköping University in Sweden and previously an independent investigator for the Swedish government in a state enquiry about practical impediments to enforcement of expulsion decisions. This is not news. For many years, people who do not return to their country of origin have been described as a major policy problem. Forgotten in this debate is that some of the people who have had their asylum applications rejected cannot actually return home. The underlying reasons vary. If the person is stateless, the designated recipient country may not see any obligation to grant entry permits. There may be political reasons for a state to deny a citizen’s return; an individual’s citizenship may have been withdrawn or it may be impossible to get to the designated country or very difficult to obtain entry permits. These “Non-Returnable Returnees” end up being legally stranded, in an uncertain position with a high risk of exploitation. In many countries, such people has no right to work and no right to emergency support. It should be in the interest of all EU countries to counter a law that results in more people ending up in this situation. However, the risk of this happening is obvious, if the Commission’s proposal is implemented. I make this claim after having conducted an independent enquiry for the Swedish government of residence permits based on practical impediments to enforcing expulsion orders, and residence permits resulting from expulsion orders having expired. The enquiry included case studies, an analysis of numerous court judgments and decisions by the authorities, interviews, an examination of how other countries handle the issue, and statistics. The investigation shows that the requirements of the individual are unreasonably high, even in cases where it is extremely difficult to obtain acceptable documentation. The fact is that the possibility of gaining residency due to practical enforcement barriers is small; about 10–15 persons a year manage the feat of being granted a residence permit in Sweden on such basis. Another problem relates to a previous main rule in Swedish case law, which grants residence permits as a result of an expulsion order having expired (becoming statute-barred), normally after four years. This rule is currently only applied in exceptional cases, due to a Migration Supreme Court’s guidance in a decision from 2009 (MIG 2009: 13). Once not uncommon, resident permits are currently granted in almost none of these cases. Previously, the extent to which the migration authorities had taken any actions in the matter was considered. Had the authorities been passive, the main rule granting residency would apply. This ought to be considered, I argue, partly because activities by executive authorities where the individual can also get guidance are important in the return process. Partly because of limited statistics, it is not possible to say how many people in Sweden or Europe, among those living as undocumented today, are subject to practical impediments. An undocumented individual may also very well be subject to such obstacles without knowing it. From the analysis of my investigation, I conclude that one reason the number of irregularised migrants is increasing in Sweden and Europe is that the legislation is interpreted and applied in a certain direction where the core issue – the practical obstacle – is denied. Swedish law allows for granting residence permits because of practical enforcement barriers, as does that of other European countries. However, despite these regulations, a number of people are in a situation where the expulsion decision cannot be enforced for practical reasons, but where a residence permit is not granted. This problem was the starting point for my enquiry, which included a number of proposals that would prevent people from becoming legally stranded. I propose a clarification of the legislation so that people whose expulsion decisions cannot be enforced for reasons beyond the control of individuals, are granted residence permits. I propose that a residence permit may be granted if a removal order has been barred, in cases where the individual’s own actions have not been the decisive reason for the decision not being enforced. I propose that an inquiry be opened into the statutory status of stateless persons in Sweden. The directive should include the submission of proposals for the introduction of a statelessness procedure. Statelessness is a common circumstance in the judgments and decisions on which the issue of practical barriers is brought into effect, including in the very few cases that have given rise to a residence permit. Other countries in the EU, and the European Commission, should take into consideration the problems my investigation points to in their policy development concerning return migration. Even though my proposals concern Sweden, they are nevertheless relevant at EU level. We do not know how many of the rejected asylum seekers actually leave, but those who cannot do so should not be placed in detention. Nor are further restrictions on welfare benefits, aiming to enforce self-return, sustainable. Either the legally stranded leave the state and become undocumented residents of another EU country, or they end up in a completely destitute situation socially and economically, which stands in stark contrast to European welfare state ideals. And why not populate with them Greenland?!? I think this matter even if it is so complicated but not so hard for the human brain to figure out a solution for it. But we must first look deeply into the full picture and then decide what will be the proper move without causing any damages .Taking facts as an act and react may rise the bad results instead of finding solutions. The first question for example to ask may be: do we need those people to stay on our lands from economical view or not? And why did we accepted them from the first place? Can’t we find out away to clear if their stories are right or wrong so we can be fair when we ask them to leave? What did we as Europeans do to help solving the problems at their homelands so we can convince them to go back voluntarily?and many more questions like that. At the end i think we must think out of the box for such major issue. 1) How many refused asylum applicants in the EU are refused re-entry in their country of origin (as a percentage of total asylum applications and in absolute numbers)? 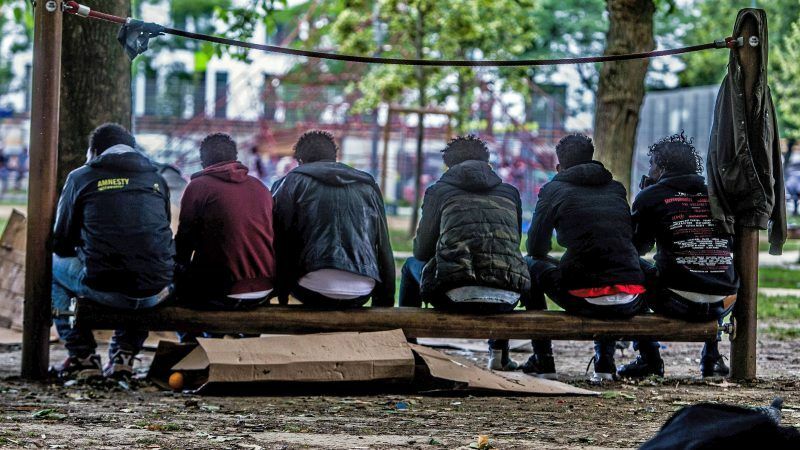 2) How many of these are what I would classify as ‘clandestine migrants’ meaning that they have entered the EU territory in a clandestine/illegal fashion? 3) How many of those refused re-entry in their country of origin are so refused specifically because of statelessness? 4) How many stateless persons are there in the world? 5) What pressures are put in place by EU / EU members on said countries of origin to take back their ‘nationals’ or ‘stateless residents’, or to solve the issue of statelessness altogether? 6) Are theses pressures sufficient and souldn’t priority be given to pressuring countries of origin take back their nationals and to solve the issue of statelessness, over clarifying the policy regarding residency permits for stateless asylum seekers? These are all important and interrelated questions on an issue and its related policy that need to be integrally reviewed and clarified. I can agree on that. The key elements that would make my opinion tip towards the proposed policy, nationally or for the EU, specifically for the Schengen area countries, are (1) the number of statelessness-based residence permits that would be issued if the said policy were to be implemented, (2) the total potential number of applicants based on such status, if such a policy were to be implemented, and (3) the degree of ‘value or ideological compatibility’ (for a lack of better term) of the potential stateless applicants if the policy were to be put in place. In order, (1) the number of statelessness-based residence permits issued would have to be extremely low, (2) the risk of triggering further migratory movements to the EU from stateless communities would have to be equally low, and (3) the degree of compatibility be relatively high, all so that it would not further fan the flame of anti-migrant sentiment in Europe. I put forward these criteria because I fear that implementing such a policy would trigger further migratory movements to the EU from stateless populations around the world, as it would become a strong EU-specific incentive if such a policy was not simultaneously and equally implemented in other recipient jurisdictions. I think it has become self evident that the time is not ripe for another such rise in migratory movement to the EU, as anti-migration political movements are strongly gaining ground around Europe, and another such wave could very well precipitate a de-integration of the EU, which would be a far greater catastrophe than the forced return of refused asylum seekers. Also, because I acknowledge that not every individual, culture, civilization is a priori compatible with EU values (democracy, equality, rule of law, secularism, etc.). It has to be evaluated on a case-by-case basis. Otherwise, the risk of societal erosion is very real on the long-term, as much historical evidence demonstrates, if too many ‘non-compatibles’ (sorry for the terminology) are let in too quickly for proper assimilation, the latter being also highly problematic right now. Simple, do a genetic test to find out where they came from and put them on the next flight to that destination. It’s a bit more complicated then that and genes is not the problem, nor should it be, legal status is, as well as the global legal framework for migration. Screw legal status, just dump them over the border. A framework is just paper, it means nothing. They didn’t abide by law to get here so we don’t have to when we send them back where they came from. The originating countries are responsible for their own citizens. If they can’t keep them in check then we will.